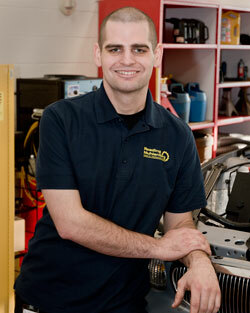 Develop the skills necessary to perform proper hands-on vehicle repairs. Expand your career options by earning your PA Vehicle Safety & Emissions Inspection certifications. Maintain, diagnose, analyze, and repair basic-to-advanced automotive systems. Learn the 3 “C’s” – Complaint, Cause, and Correction – used in the automotive repair industry. I’ve always enjoyed teaching, presenting, and helping others with something they don’t understand or want to know more about. Upon graduating from high school, I was originally going to pursue the college route to become a math teacher. However, what I really enjoyed doing was working with my hands, problem solving, and working with tools. So I turned my hobby into a living with Ford Motor Company and found my tenure there to be very rewarding. From ambulances to police cars, small sedans to the largest trucks, I did it all. I want to help other kids pursue the same career and realize that the trades are rewarding even more so now as vehicles become more complex. I look forward to giving back to communities in which I grew up and now live by encouraging my students to pursue their dreams in the trade of automotive technology! I worked at a Ford dealership performing all repairs from simple oil changes to complex internal engine repair. I also had the unique experience of being able to work on a fleet of ambulances and police cars from the Lehigh Valley area. During my time in the field, I achieved Master Technician status with Ford.